Be Both Flexible & Strong! Become Flexible Steel! Strength without flexibility is incomplete at best. Flexibility without strength is also incomplete- You must strive to attain and maintain a balance of both. Flexibility training means the systematic practice of moving through a full range with strength, control, and fluid grace. This training encompasses all aspects of stretching including but not limited to mobility drills, dynamic warmups, isometrics, passive stretching etc, etc. Everything has a time and place the trick is all about timing and programming. Beware of experts that say stretching is bad. Most are simply marketing something else and when you look into the alternative they are promoting it turns out to just be another form of stretching as defined in the previous insight. Do not throw the baby out with the bath water. Make good use of counter stretching. Superset opposite movements. They will improve each other. Examples: Side splits & windmils or Jefferson curls superset with Dr. Mark Cheng’s Sphinx. Combined mini-contractions of the target muscles with longer static holds in series going deeper and deeper for a minimum of 3 cycles per set. Become strong in end ranges. Program and cycle your flexibility training just as you would your strength training. Use sets and reps and rest periods between sets. Wave your load by putting in hard days, medium days and easy days. Use harder variations of the same stretch to vary intensity. If you just stretch as an after thought your results will reflect this. This goes for all training: Seek challenge without struggle! Challenge means what you are doing is difficult enough to demand your full attention but you are able to complete the move without compromising form. Struggle means you have to resort to monkey business, bad form or other undesirable behavior to make the attempt. If you owned a BMW chances are your would not or could not do mechanical work on this high performance machine yourself. But it is amazing how many people try to work on themselves …a much more expensive and complex machine. Do yourself a favor and hire an expert trainer. Checkout our Instructor Directory to find an expert near you. These are just some insights into our system at Flexible Steel. If you are interested and want to take your training and knowledge to the next level join us at an upcoming live cert. I will be in New York City March 11th 2017 and would love to see you. 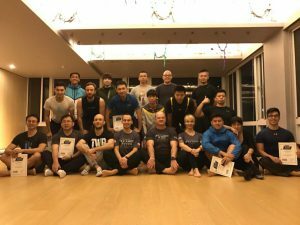 I just finished up teaching the first Flexible Steel Instructor Certification in Taiwan. The students loved it and they were thrilled with the results they saw that day and excited about the potential they will have to change the lives of their students. Flexible Steel is truly world wide with several more countries coming onboard in the near future so you will be able to find an instructor in any corner of the world. What would more usable range of motion do for your sports performance? Imagine not having to fight your own body. Imagine owning unhindered fluid movement that was at your beck and call. How much more enjoyable would life be if you could recapture the vibrant mobility of your youth? Understand I am not talking about the weak flexibility of a guy who can tie himself into knots at the expense of his strength and power.Oh, no! I am talking about strong, powerful, usable flexibility that will aid you in your everyday life and sports performance. Interested? Follow this simple 4 week program and I guarantee you will get amazing results and be well on your way to becoming like Flexible Steel. Give me four weeks (that’s sixteen sessions total) and I will breathe new life into your high mileage body. The late, great Jack Lalane could easily be considered the godfather of fitness. Jack was way ahead of his time. He did not train clients, he taught students. He did not work out, he practiced. His training sessions were called lessons not workouts. We can learn much from this seemingly random change in wording. It is in fact not random at all, but craftily chosen to make a very important point. Do not mindlessly chase sets and reps, poundage and times, rather go to the gym, field, track, whatever and try to get better at something. Try to learn a lesson try to improve your technique form. Try to learn something. What happens when we shift our thinking like this is we naturally hit PRs, we keep our mind and body engaged and we keep injuries at bay. It bears repeating go to a practice or a lesson, not to a workout. Learning keeps one young. My friend and colleague Dr. Mark Cheng calls the hips and shoulders the four knots of the body. While this may be common knowledge in Eastern medicine, it is not so common here in the West. The four knots have several meanings. Let me explain: The shoulders and the hips tie the arms and the legs to your body, this is obvious. But to take the knot analogy further, in order to function properly a knot cannot be too loose – it comes undone and your shoe comes off, or it’s too tight, in which case you cannot untie it and you cannot ever remove your shoe. In order to have a functioning knot you must have a perfect balance of strength and flexibility. You must be like Flexible Steel. Flexible Steel bends, but does not break. For the next four weeks our lesson will be on gaining more flexibility and mobility in the hips, T-spine, and shoulders. Why? Because we will get a very big bang for our buck if we can make even small improvements in these key areas. It had been said “An athlete must move from their hips first.” Gray Cook the founder of the Functional Movement Systems (FMS) calls the hips a BAD neighbor. Meaning if you do not have strong mobile hips your knees or lower back must compensate. Anyone’s knees or lower back hurt? 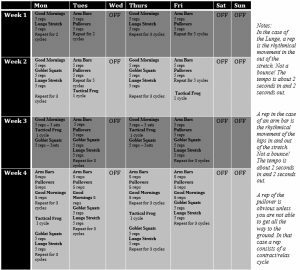 The four week plan I am posting here is designed to be done in the morning before your normal training. You may still do whatever other exercise or activity is on your schedule, but do this first. Do not consider it a warm-up or a workout but rather a movement lesson or practice. 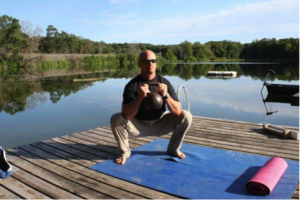 Dan John, author and strength coach extraordinaire, developed the Kettlebell Goblet Squat. We have found that a month or two of practicing this form of squatting has a dramatic opening effect on the hips and T-spine. It will boost your regular squat performance – no matter if front squats, back squats, or whatever other variation of the squat is your huckleberry. Grab a kettlebell by the handle, kind of like grabbing onto a steering wheel. Pavel calls this “taking the bell by the horns.” Squat down by sitting back and down between your heels. Make sure your knees line up and stay lined up with your toes. Your knees must point the exact same way your toes do through the whole squat. Keep your heels on the ground and your shins vertical. Keep your back straight; do not allow your tailbone to tuck under at the bottom of the squat. Keep a “big” chest, especially at the bottom. At the bottom, place your elbows to the insides of your knees without losing the alignment of your back. Use your elbows to push the knees out to help open your hips. Your feet must stay firmly fixed to the ground. Make sure when you ascend that your hips and shoulders come up at the same time. Use the goblet squat as an exercise in mobility as well as stability. Hang out in the bottom position for a while. Rock side to side, make some small figure eights, really open the hips, and elongate the spine and try to make space inside your body. One of the easiest and most effective stretches I know for the hamstrings is the Good Morning stretch and its several variations. Here is an extremely effective variant of the classic Good Morning. 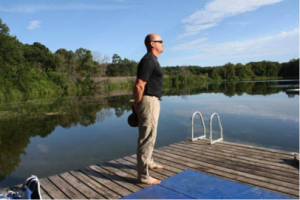 Quick Tips: Stand completely upright, feet about shoulder width apart. Hold a kettlebell behind your back so that it rests more or less on your tailbone. Puff your chest out,big chest, and let your knees be “soft”. It is not necessary or desirable to have them locked. Do not worry about how far you bend over; this is not a toe touch. Just be concerned about how far back you can move the kettlebell. It is a hip hinge. If you perform this move to the letter, you will feel a very intense stretch in the hamstrings just below your cheeks, not the ones on your face either. 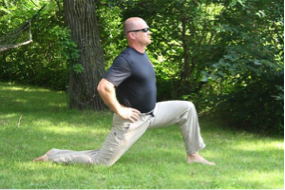 Get into a lunge position by kneeling down on your right knee. The instep of your right foot will also be on the ground. Make sure to align your knee and back foot so they fall on the same line. Your front foot will be on its own line and your left knee will be in the air. Make sure your left shin, in this case, is vertical and your knee is tracking your front foot. Do not let your knee get in front of your toes. Keep your hips square. If you can imagine that you have headlights on the crests of your hips, just make sure they both shine straight ahead. Now put your hands behind your back and push your hips forward. You should feel a stretch in the area of your front thigh and hip, kind of where your front pocket is. Push into and back out of the stretch using a rhythmical movement. The tempo should be 1 second forward and 1 second backward. Contract the glute of the stretching side to a) protect your back and b) relax the hip flexors through reciprocal inhibition. If and when your knee begins to creep in front of your toes, simply re-position your front foot into a deeper lunge. Sigh when you are moving into the stretch and this will help relax the target muscles. Tilt your hips up, posterior tilt, before you even begin to stretch, to put the target muscles into a nice pre-stretch. This will further your efforts. The effect of the Arm Bar on the shoulders, T-spine and all around posture is apparent as soon as you perform the movement. You can instantly feel a dramatic improvement and an opening throughout your entire body. Let’s examine the classic Arm Bar technique. The Arm Bar starts out the same as its more familiar cousin the Turkish Get Up. I write this assuming you already know how to do a Get Up. If you do not know the Get Up then stop reading now and get thee to an Instructor and learn the Get Up. Lie on the floor with a light kettlebell on your right side. 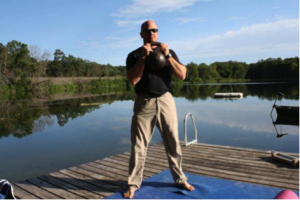 Grab the kettlebell with a pistol grip, right hand on the inside and left on the outside, pull your elbow to your ribs. 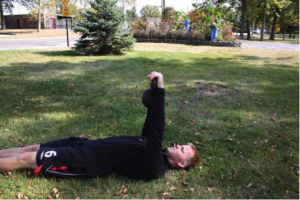 Roll onto your back prying the kettlebell up as you go. Now using both arms press the bell into the firing range position just as you would for the Get Up. Things start to differ from the Get Up at this point. Focus #1 -The kettlebell and working arm must maintain vertical (keep the kettlebell arm vertical in all planes without actually looking at the bell.) Rest your head on the left arm. Focus #2 -Rhythmically begin pumping your hips, trying to get the right hip, in this example, to the ground. It will help to contract the right glute, and breathe, sighing into the extension. The timing should be one rep every two seconds. Focus #3 -Try to make your right collar bone or chest area longer. 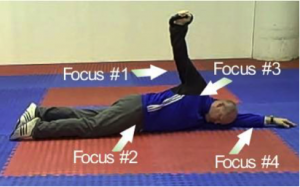 Focus #4 -Wiggle the left arm (the one on the ground) further and further behind you. Think of stretching the lat. When you have had enough sloooowly reverse the above process under full control. Grab a light kettlebell with both hands; hook your thumbs through the handle in such a way that allows the body of the bell to rest on the insides of your forearms. Press the bell straight up over your chest – kind of like a bench press. Engage your lats and lock your elbows. They must stay locked and your lats must stay on throughout the maneuver. Now slowly lower the kettlebell back and down in an arc so it winds up above your head on the ground. Take a breath contract and reverse the arc to “pullover” and end up above your chest. Repeat for between 5 and 10 reps. Note: If you cannot make it all the way to the ground without your shoulders coming unpacked or without bending your elbows then go only as far as you can and do some contract/relax stretching letting the weight of the bell take you down several inches with each relaxation. Be conservative. You may go deeper on each consecution set. With time you will be able to handle the pullover proper. The Tactical Frog is a magic bullet for gain some incredible control over your hips and improving your overall squatting performance. It has a dramatic effect on almost any athletic movement. I will start this program off very easy because I would rather have something simple and 100-percent compliance than something complicated and half hearted adherence. Four sessions will be posted each week, for the next four weeks. Do them on whatever days suit you best, but do them. And have no fear, by the end of week four you will gain momentum and be doing the full program. Flexible Steel is a mobility/flexibility system that does not sacrifice strength for mobility or mobility for strength. 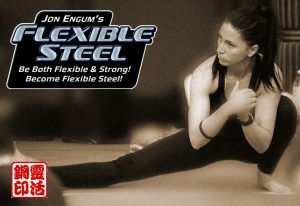 Flexible Steel is a system of secrets for regaining your youthful mobility and mastering the art of flexible strength. Be both flexible and strong in perfect harmony.